I think you're right. Spring does seem later this year. Not just me then! 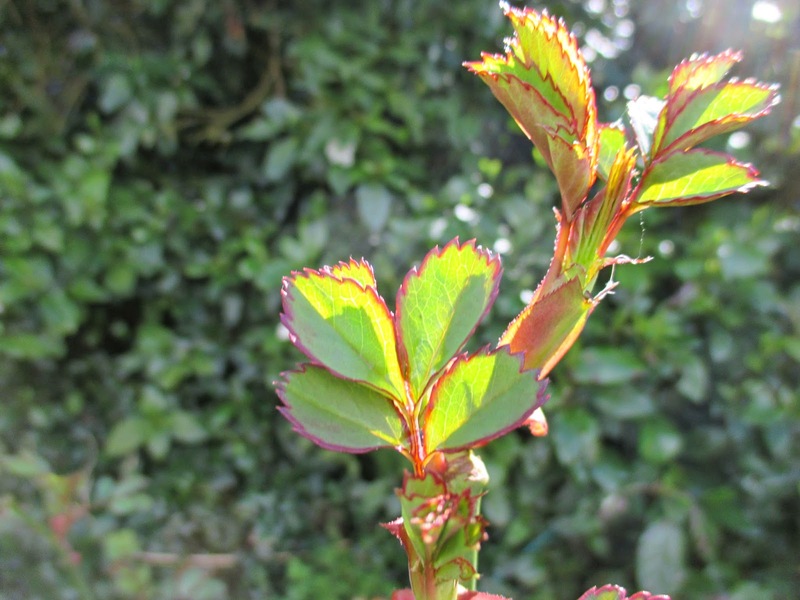 Your red edged rose foliage is gorgeous! That is interesting, Jessica, as I didn't know it our late spring was very localised or not. 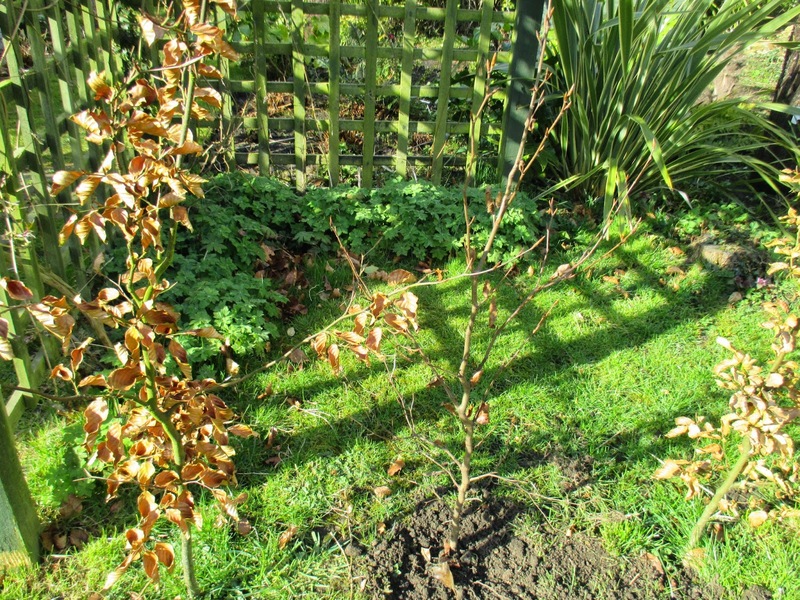 I will have to go out and locate that rose foliage so that I can give it a name! It is irritating me to not know which one it is! Hi Mark & Gaz, have you started putting your stabled plants out to pasture yet ? We are keeping all ours as they are for now and not taking any chances, even though the greenhouse is full to capacity. We don't want to risk anything. You are so much further south though, so it may be different for you ? I thought March came in like a Lion but it was only a cub compared to how it is going out! 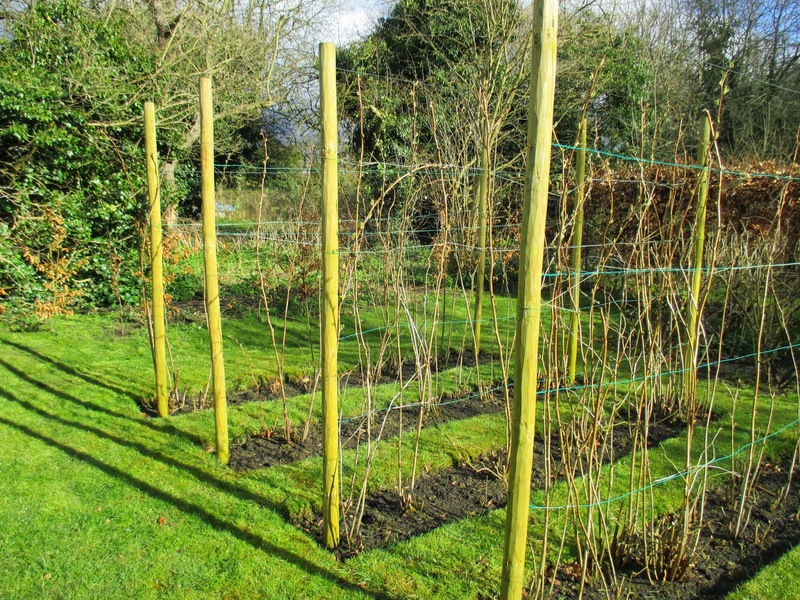 It is always interesting to read what is flowering in other bloggers gardens, Kerria is flowering here in Worcestershire. Your green house sounds very productive. Hi Brian, I agree, it is always interesting to know what is happening in other gardens, both in the uk and around the globe. Kerria is just beginning to come out now, but I saw a forsythia hedge today which was still in bud. We are very late this year! 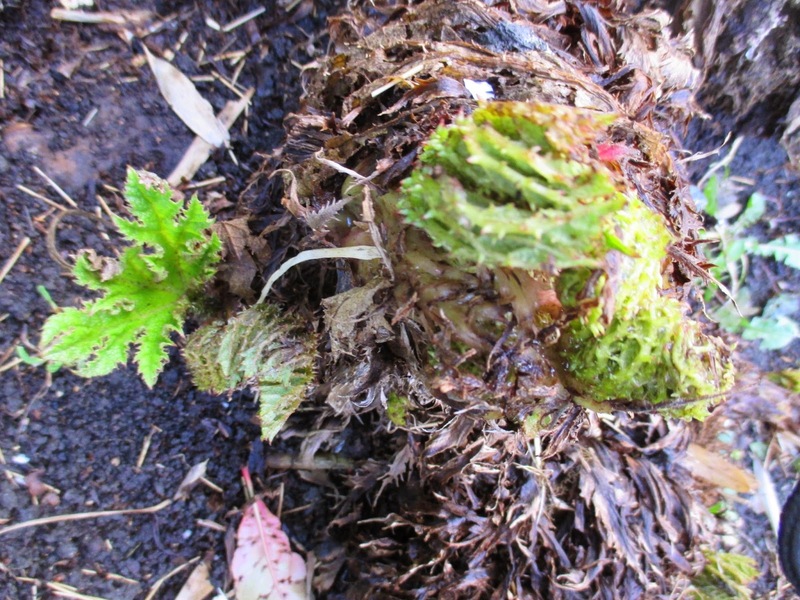 I believe that you are ensuring that spring WILL arrive :) It all looks very nice and green from here, of course; all that burgeoning growth is wonderful, and I certainly admire your skill in propagating all those plants. I must learn...! PS That polyanthus is to die for...! Hi Amy, yes, I love 'Miss Indigo', she is one of my favourites. 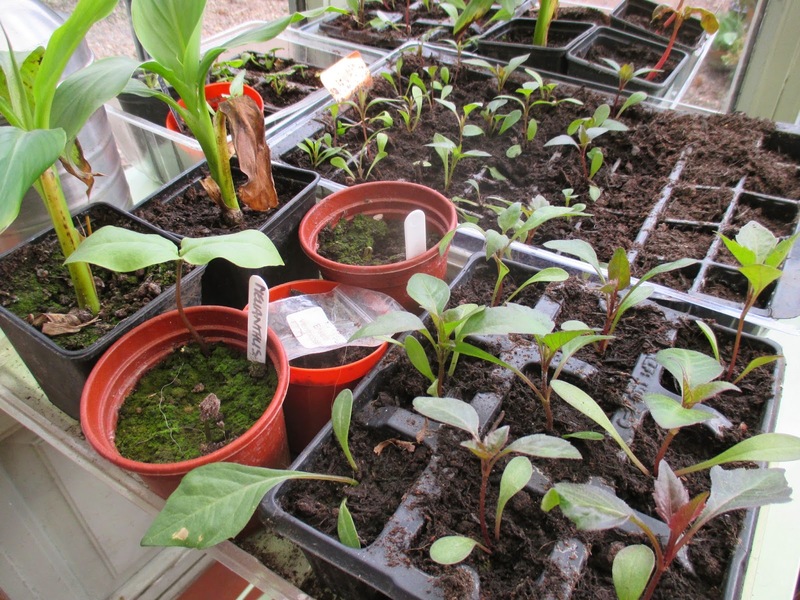 I really enjoy the propagation side of gardening, and get real satisfaction from seeds and cuttings etc. I think the thing is that there is never much at stake if things go wrong - it's only the cost of a packet of seeds at worst! March went out like a lamb for us here in the middle U.S. today, but we're still behind you. Your garden looks fresh and green and colorful! Glad you are experiencing gentler weather! I have just taken the dogs for a walk and the wind was still very high and cut like a knife! 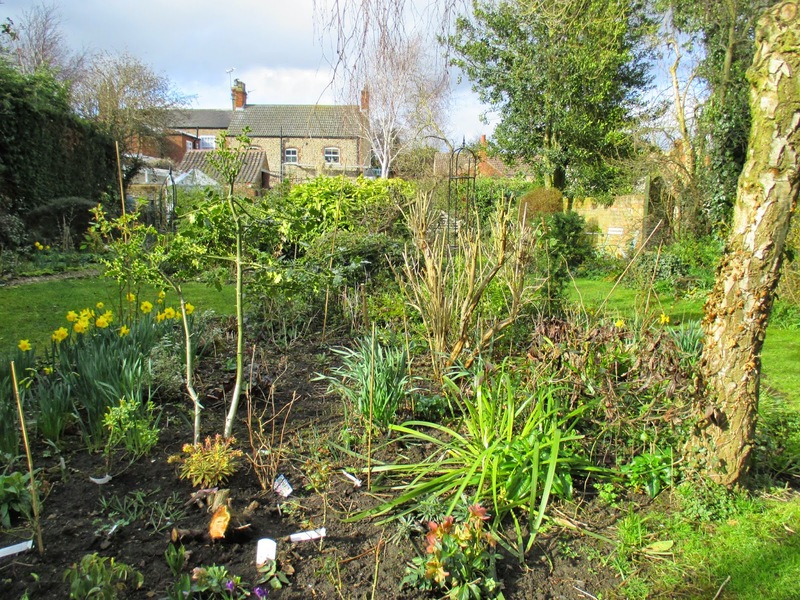 Dear Jane, even though you write that March this year was a relatively cold month for you and plant growth is slow, to me your garden looks like it is exploding into spring. All the very intense "British green" (is there a color with the name?) makes me almost giddy with joy. It appears so different from our "dry, arid climate green". 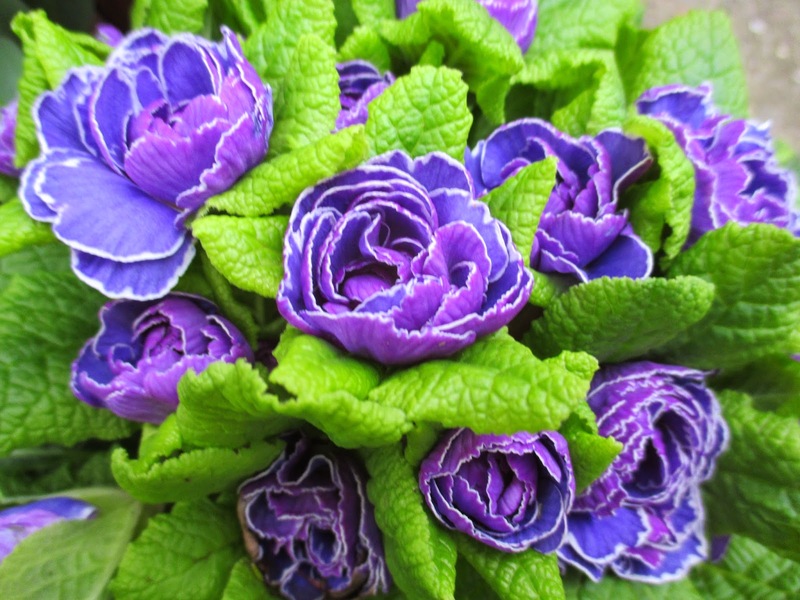 I love the blue and pink/lavender colored primroses from this post! 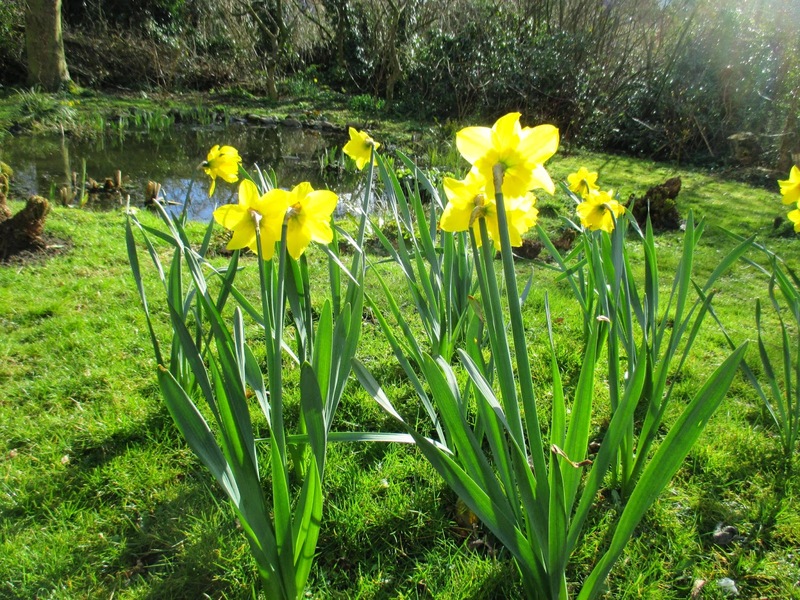 And all the daffodils are so cheerful. 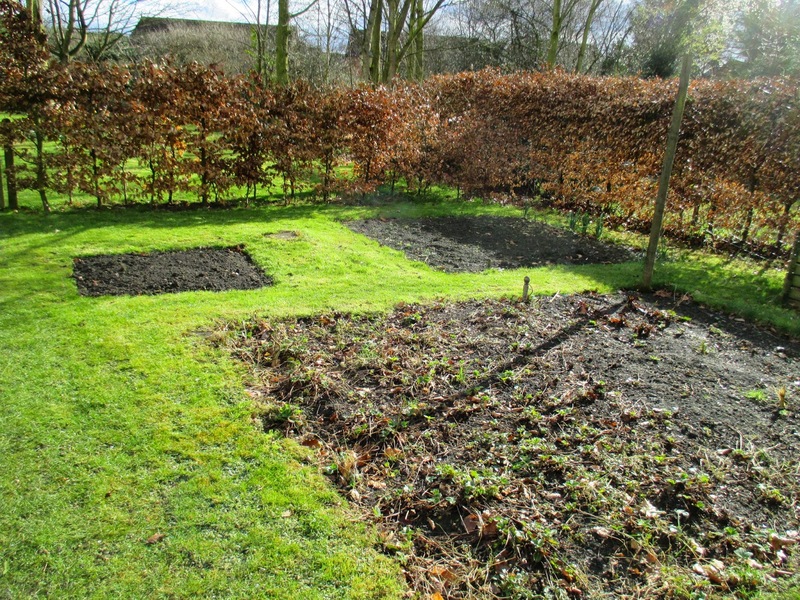 Spring might have come slow to your garden, but judging from you photos it is definitively there. I thoroughly enjoyed reading your post! Thanks! Hi Christina, thank you for your comments. Sadly I think the 'British Green' (now an official colour, I think!!) is mainly due to moss rather than grass in my garden! It is so vivid though, and is only really this shade at this time of year. 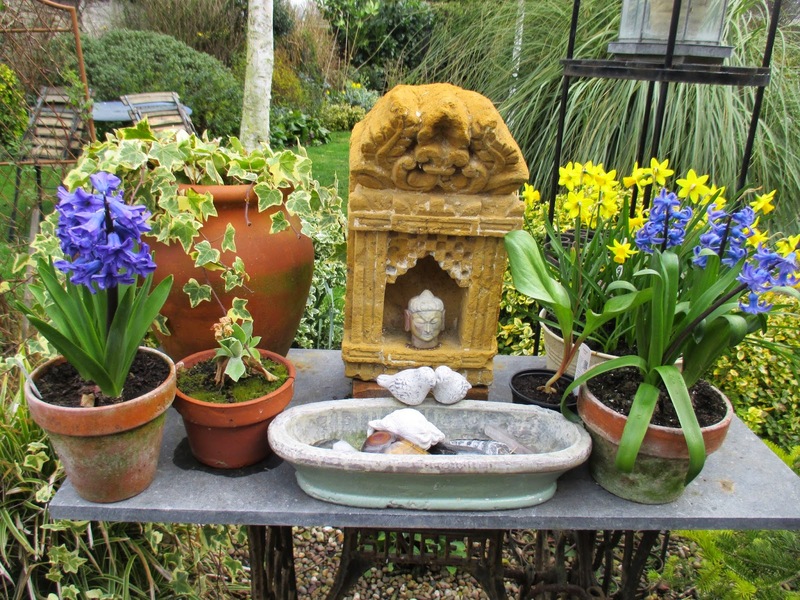 Spring has sprung, I guess, but I just wish we could have a bit of gentle sunshine to go with it! At least you have proper records to prove whether spring is later or not, I just have my hunches - and the lack of photos of anybody in the hammock... Wonderful to have a new bed to play with, shaping up well. 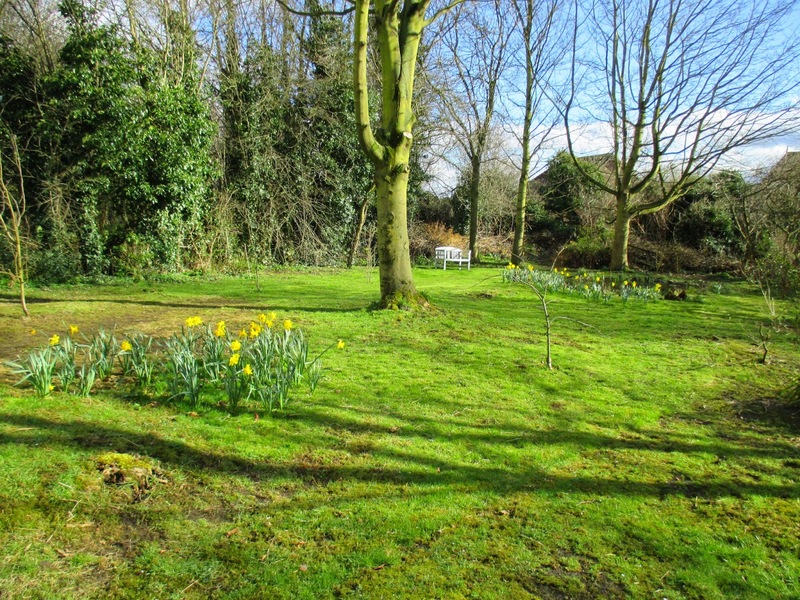 I love your sweep of mossy grass with clumps of daffodils, and am full of admiration at how neat all your grass looks. 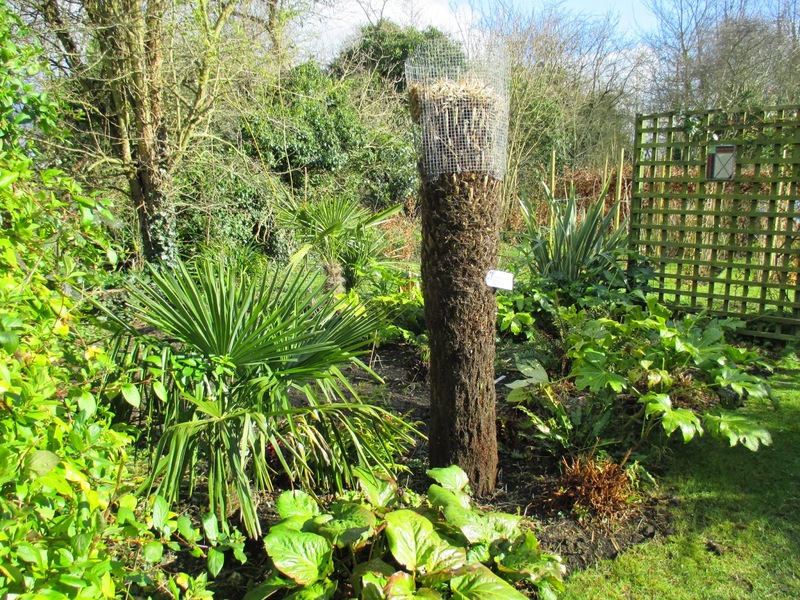 Mine is still distinctly shaggy... Where do you source your bare rooted perennials? I'd love to grow more like that. Hi Janet, the neat grass is down to a diligent partner, keen to give it its first haircut of the season! I buy lots from the internet, and I know that T & M have an offer on now for 72 perennial plug plants with big savings. Unwins and Mr Fothergills do bare root, and van Muewen (cheaper sister company of T & M) often do. Indeed spring is far behind compared to last year, here also about two to three weeks and the weather at this moment and yesterday and the day before yesterday: awful, storm, rain, hail and in between some sunshine. Yesterday I have sown some annuals, the seeds I sowed last month are germinated but grow so slowwwww. 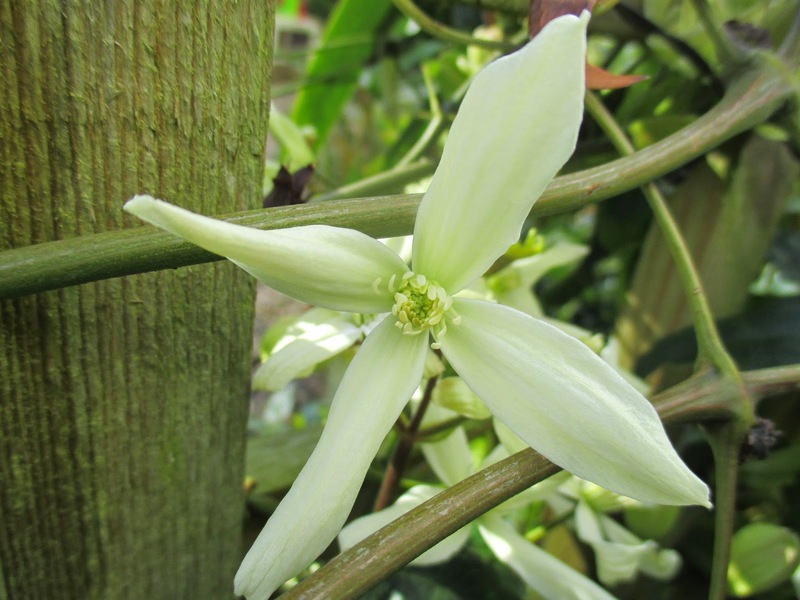 Your garden was a surprise, so unusual but interesting and nice that sub-tropical garden, your Clematis armandii is beautiful, here it died three years ago during a cold winter. 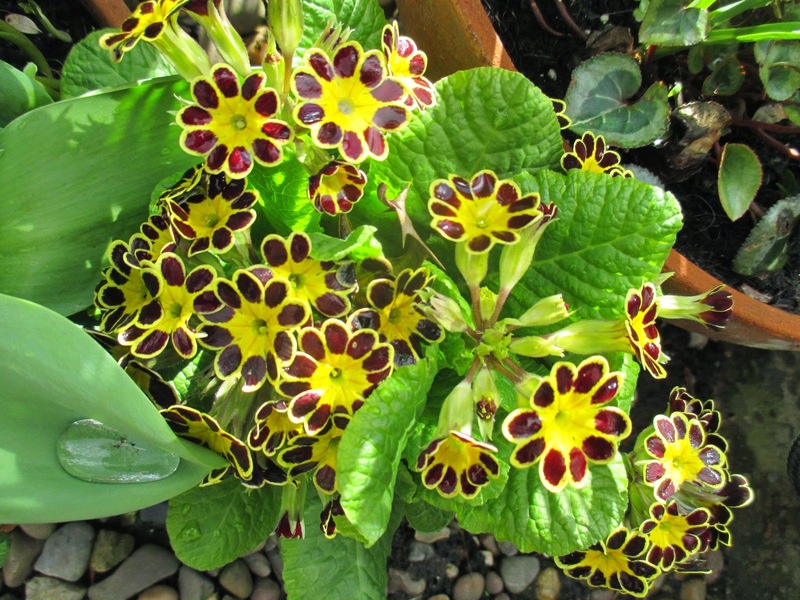 You also have some wonderful Primulas and I saw some Auriculas too on your etagere and table, very promising. Hi Janneke , I was interested to read that Spring is slow with you too, and that you too have had storms and strong winds. 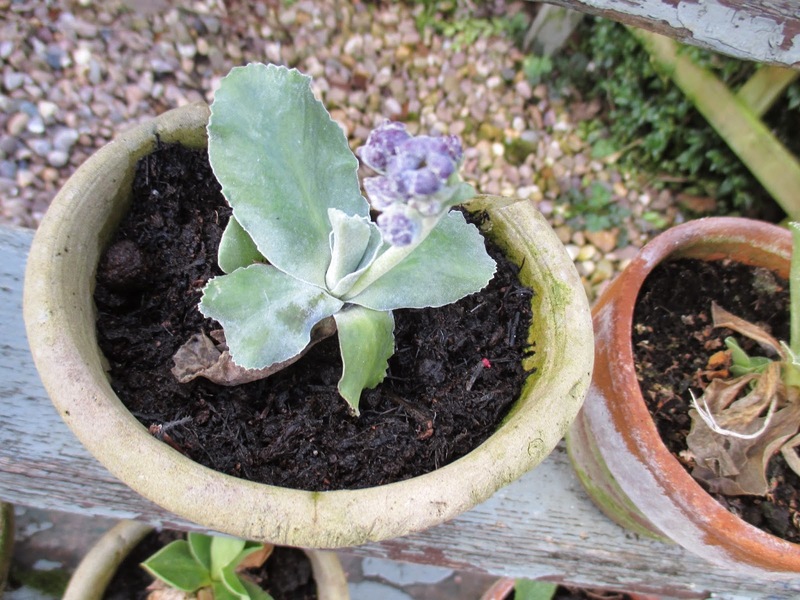 You did spot Auriculas, and I have lots of them, just budding now. I know people have very mixed views on them, as they are a bit stiff and formal, but I adore them. Do you have them too? 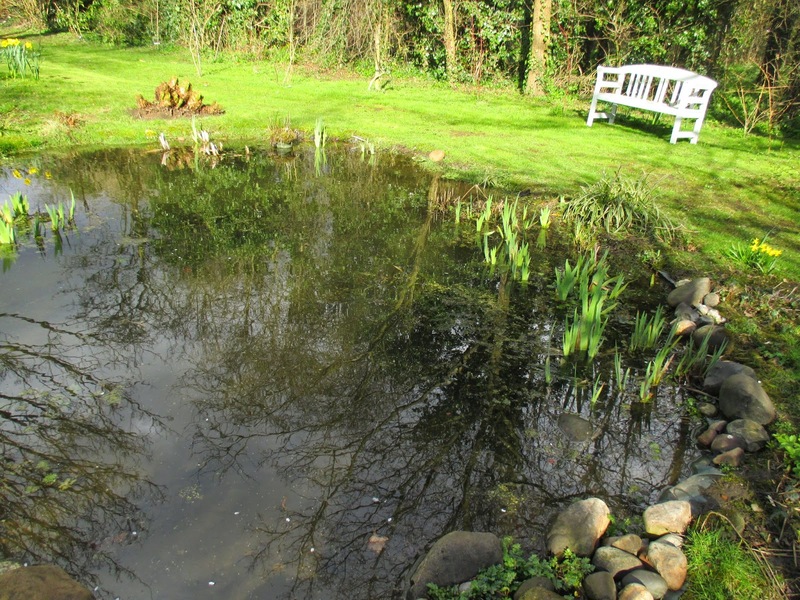 Hi Sue, we were surprised how quickly the pond naturalised and populated. I got sticklebacks from a friend, and there are lots in there now, newts , frogs and toads came almost immediately as did varieties of beetles, leeches, snails etc. Fascinating how that happens! The weather may well be rotten but your garden is looking absolutely wonderful Jane. Lush and healthy, it certainly is. Very slow here too and to be honest, I'm sick fed up of it now. I've just seen the weather forecast and we've to expect minus 3 tonight, will it ever end. New border planting looks great and a nice choice of plants. Oh no! Minus 3!! That is really depressing! We just don't seem to be moving at all. I took the dogs today on some open heathland and the wind cut like a knife - it was like January. 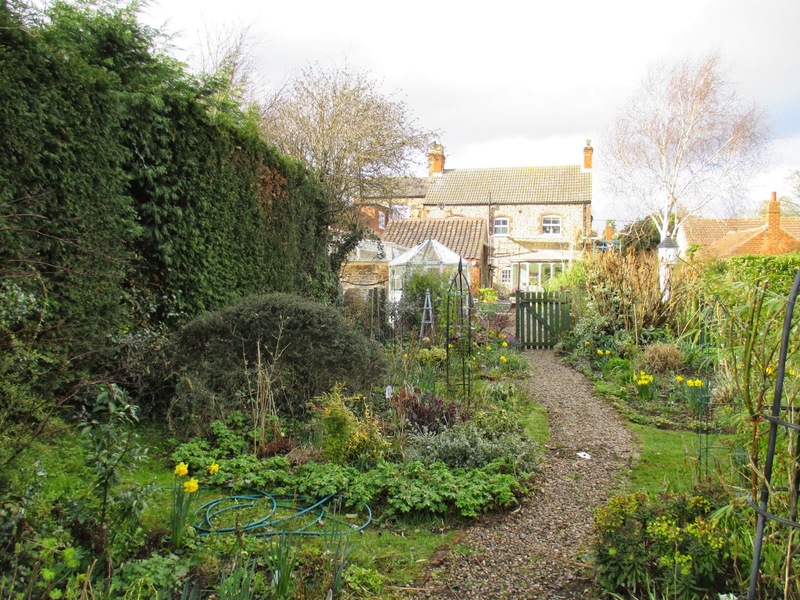 I am popping over to yours next to see how your garden is faring in this slow old spring! So sorry you're having such a cold, late spring. We here in the PNW, in the western U.S., are having the opposite -- a warmer, drier than usual, early spring. So very strange. 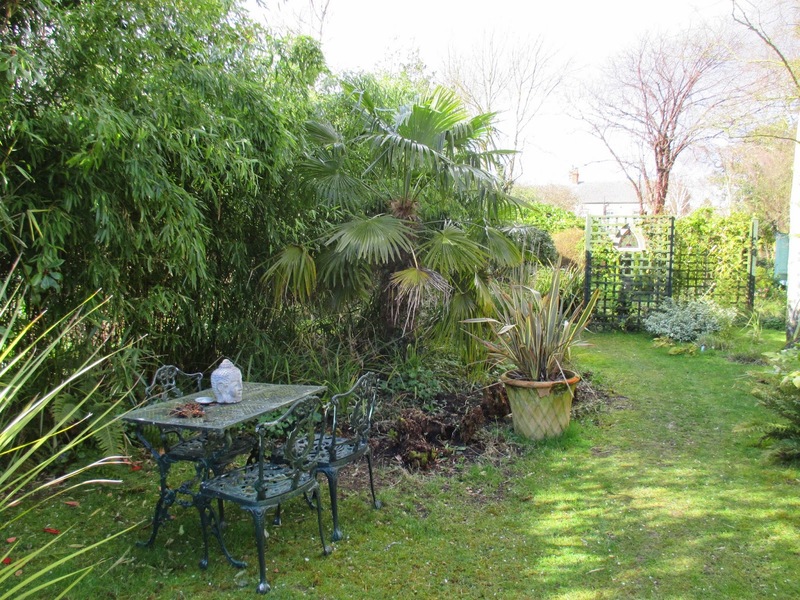 Even so, your garden looks lovely. The red margin on that rose foliage is fabulous. I've never grown Aconitum, but I got some seed this year and I plan to give them a try. Hi Alison, I'm sure you will enjoy your Aconitum. 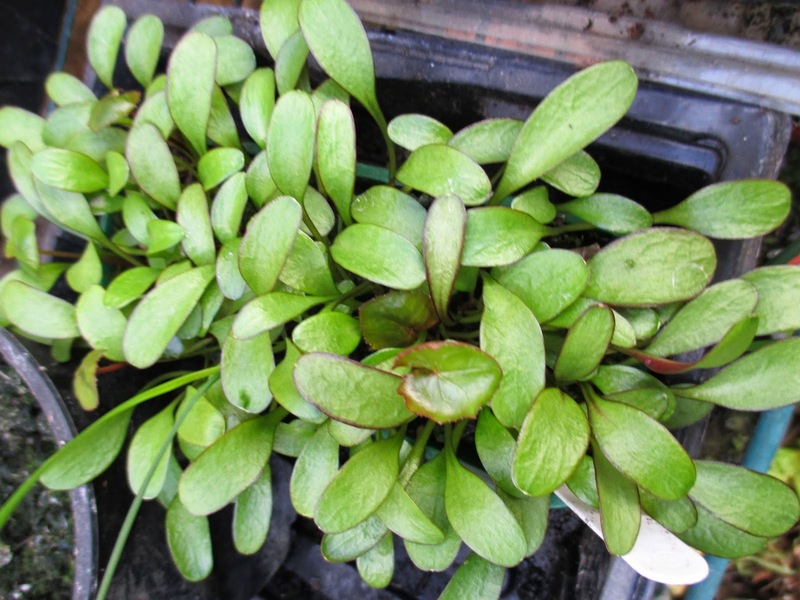 I have never grown it from seed, as I just divide the clumps in the garden, so I don't know how easy it is. It is highly poisonous though! Hi Jane, I had a mental picture of you and your hubby sitting bare bottomed on the ground as your neighbors peek over the fence! Such is my weird sense of humor! You have so much coming up and your gardens are so inviting! I personally think moss is way better than grass! The Primrose is spectacular....and roses leafing out! 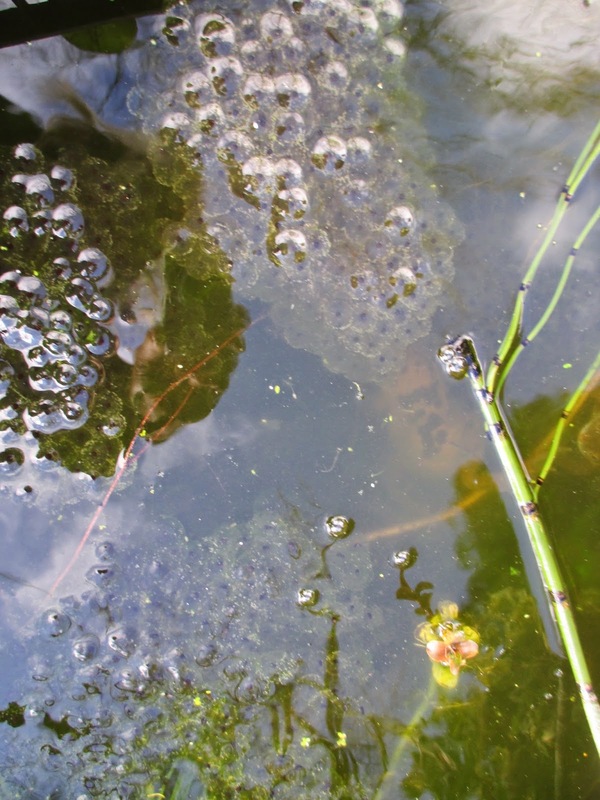 The frog eggs brought me back to my childhood when we would take them home and check everyday for them to turn into polliwogs. Hi FF and thanks for comments! I guess 'Polliwogs' are tadpoles ? I have never heard them called that before ! Far too cold for anyone's bare bottom to be on display, especially mine!! 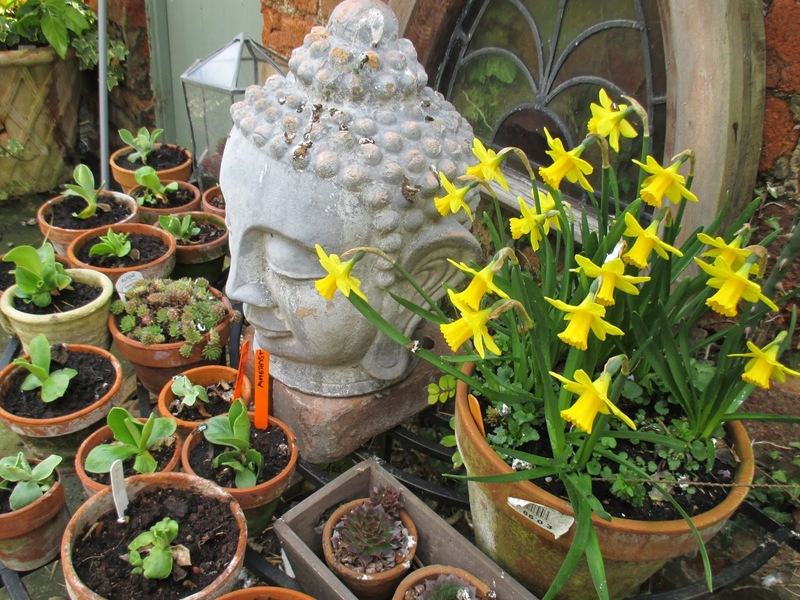 There is a lot going on in your garden, but it is the cheerful daffodils that really catch my eye. Hi Lea and thanks for your comments.Daffodils are very hard to beat as they are so reliable and colourful! I' m glad you haven' t being testing the soil with your bottom this week with these icy winds. The gales seem to have been all over the country. I hate wind. 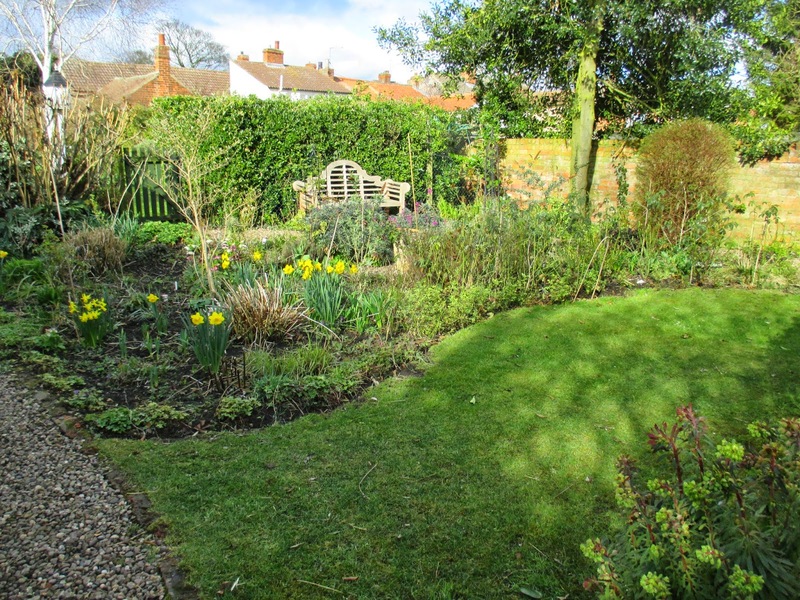 Spring might be a bit late but your garden looks lovely and goodness, isn' t it tidy. You have so many interesting plants coming on, how exciting. Oh Chloris, thermals are back on this week! Spring does seem late - I still have swathes of bare earth with little dots of colour, and I guess the blog focuses on the little dots of colour, so can be a bit misleading as to the overall picture. Oh, love to see your beautiful yard and garden with a such beautiful flowers, blooming & colorful...I always dream if I could have a country yard home...so calm & greenish..
Hi Normala and thank you for your kind comments. There's such a lot going on at the moment, it's always a busy time of year. We've had a bit of sunshine here today and it's made such a change from the dull days and howling winds that we've had just recently. Hi Jo, we have been the same here, and for the last few hours of the day have had warm sunshine, and no wind. It really felt as if winter was finally behind us ! I think the moss is lovely. Your primroses are gorgeous. How big is your property? It looks like your beautiful gardens are extensive. 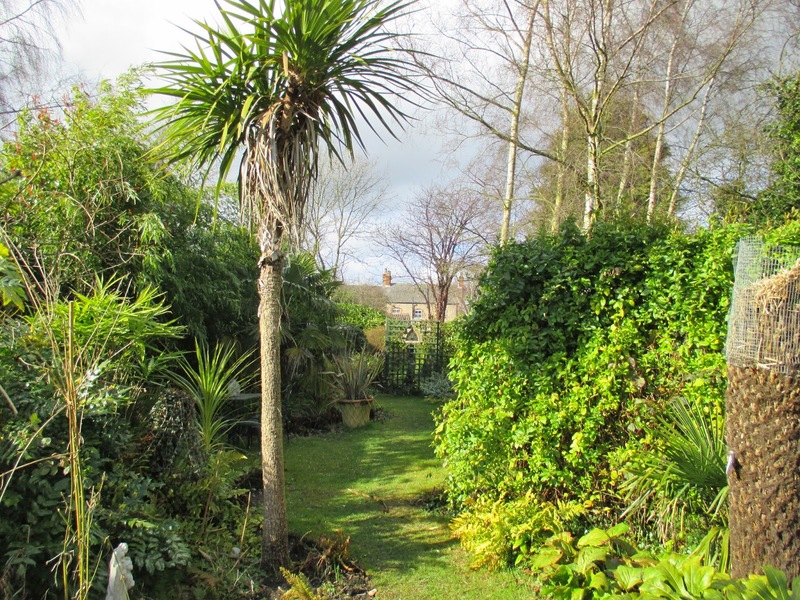 I know it is probably quite chilly but your garden looks like a lovely tropical oasis from where I stand right now. Daffodils and palm trees, oh my! I want to sit at that little iron table set and have a cup of tea. Spring is definitely late coming to my part of the world. March came in like a lion and went out the same way. We are still receiving snow (how is that possible?!?!) while I wait ever so patiently for spring to arrive. Oh dear Marguerite, I will try to stop moaning in view of what you have said ! Snow ! I think there would be tears before bedtime in this house! Stay patient and I'm sure you will be rewarded soon! We have had the same delayed spring. It snowed on the weekend and my hubby grumbled, "Is this Christmas or Easter?" 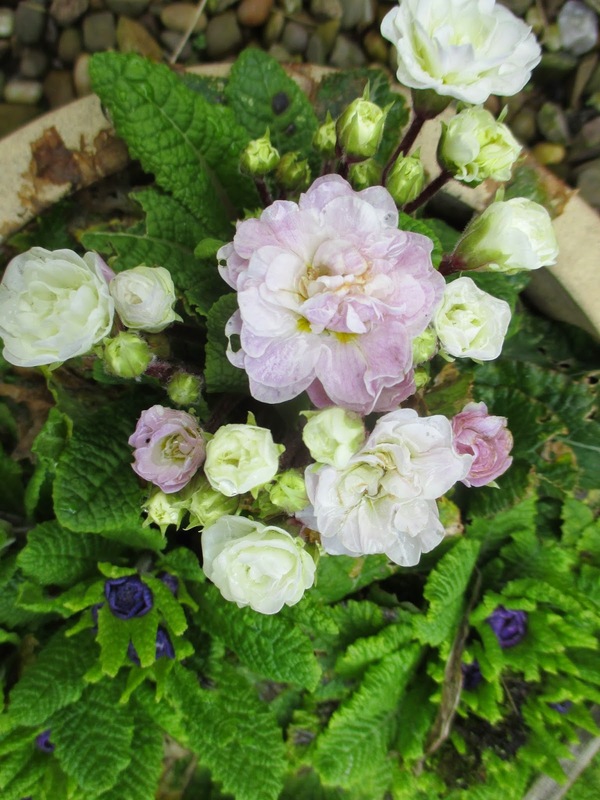 When spring is slow to arrive however, I think you notice the small things that you might otherwise miss like the red edge on the rose leaf.I love your purple opener and the pretty Polyanthus 'Gold Lace'. Hopefully I too can start some seedlings soon. Although our spring was delayed we have had a couple of days of delicious warm sun, and everything is now galloping to catch up, it is really weird! I think you are right though, you do learn to take pleasure in the small changes and really appreciate them! Hi Jane ! I love you grow so many different plants and your narrow garden is gorgeous in spring. You don't have roses, yet, but you have a lovely fragrant Clematis :) Greetings from Greece ! Hi Dani, thank you for your comments. i am waiting patiently for my roses to bloom, as that is the best part of the whole year for me !